Collecting payments from customers is not a game, which is why it’s surprising that two-thirds of small businesses continue to go through the long-winded process of invoicing their customers manually. Endless paperwork, adding numbers by hand, and waiting on processes that aren’t in your control like the postal service can be avoided by implementing a simple electronic invoicing system that can automatically handle these tedious tasks for you. 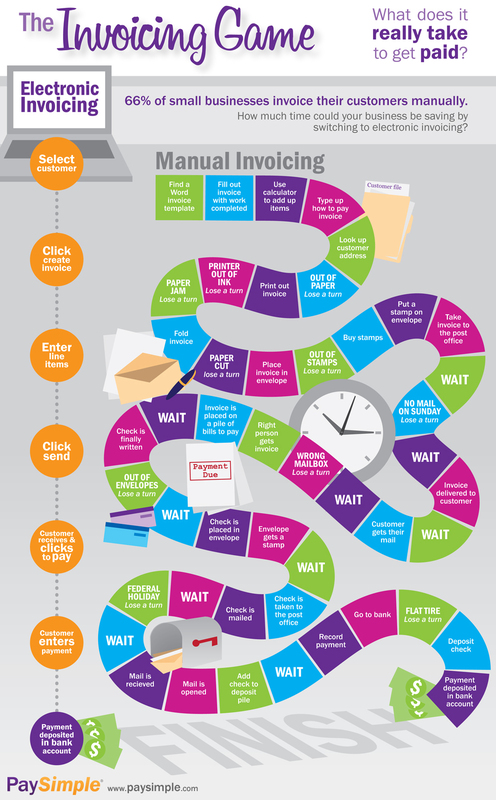 Kristi Siedow Thompson, PaySimple’s Graphic Designer, created this infographic below to illustrate how an electronic invoicing system can make managing your business simpler. How much time (and money) can you save your business by switching to electronic invoicing?